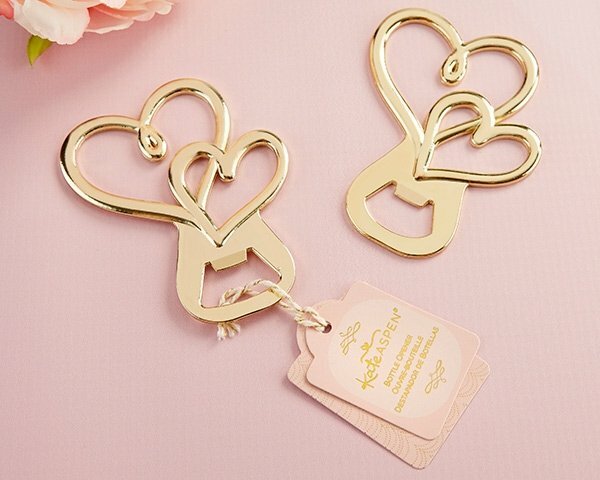 Kate Aspen's Gold Double Heart Bottle Opener favors are the perfect way to pop the top on a great wedding or bridal shower celebration. Featuring two interlocking gold-toned metal hearts, these bottle opener favors are gift that guests will love to take home. I notice there are only 10 in stock. Will there be more soon? Yes, hopefully we will be getting more stocks soon. Do these gold durable heart favors come boxed? The Gold Double Heart Bottle Opener is not boxed but we have the other version, the Metal Double Heart Gold Finish Bottle Opener Favor which is presented in a Bokeh themed gift box with clear top and is wrapped with an ivory organza ribbon and bow. Does personalization on the tag increase processing time? By how much? Yes, and it takes 2 weeks for processing and shipping. 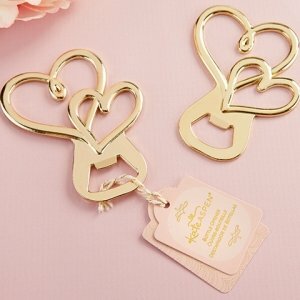 Additional $0.35 each if you want to add a personalized tag of this Gold Double Heart Bottle Opener.